Today, is my eldest son’s birthday. 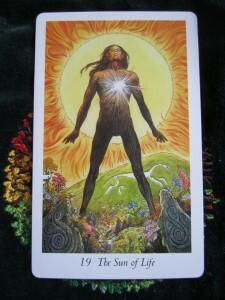 And what better card to have for today than The Sun. I had hoped to turn this card over by sheer dumb luck, but I did not. So, I went a hunting and pulled it out anyway! When I was pregnant with my eldest, this card came up a lot. And this is how he makes me feel: like I could burst! I had never imaged that I could have so much love for one I gave birth to. I knew I’d love him, I just did not realise how much I could love someone. Despite all the tantrums he’s thrown at me over the last five years (and the ones yet to come!) I still love him. And his little brother.